Amazon commonly forgets to reimburse for losing/damaging inventory in a fulfillment center. They’re supposed to reimburse you after 45 days of losing or damaging inventory, but they often do not! They may also forget to reimburse you when a customer gets a refund, but then doesn’t return the item within 30 days. Potentially you can recover THOUSANDS of dollars with the help of this spreadsheet, and there are MANY USERS WHO HAVE DONE EXACTLY THAT!! Don’t pay a percentage of reimbursements, or a monthly fee, to a reimbursement service when you can pay once and easily do it yourself! 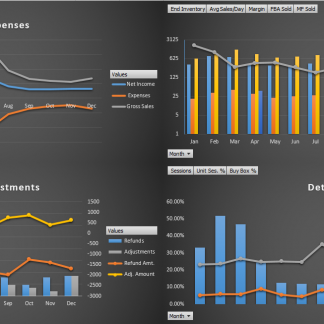 **Regular & Enterprise – works with all versions of Excel 2010+ – Charts on the Summary sheet will not work in Excel for Mac. 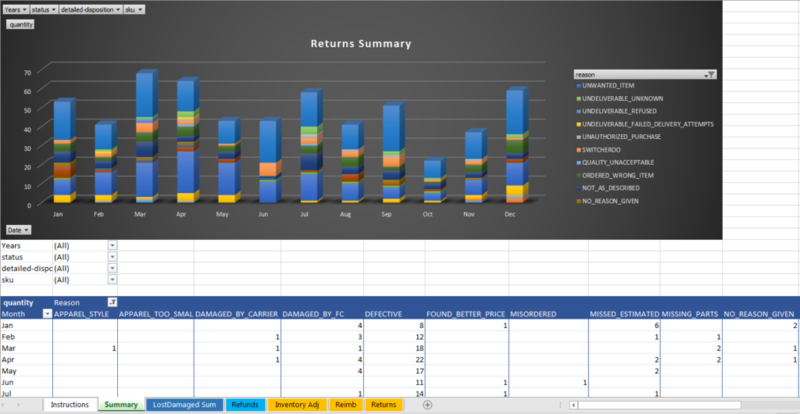 We recommend the most recent versions of Excel for Mac 2011 or 2016. ++All versions work with Amazon.com, Amazon.co.uk, and Amazon Europe (Spain, Italy, Germany, France). For the Lite version, Refunds use a different Amazon report, and is not as robust in features. – Added "Seller Notes" to Refunds sheet – this field is populated from the order seller notes using the new Auto-import feature (for pc users). 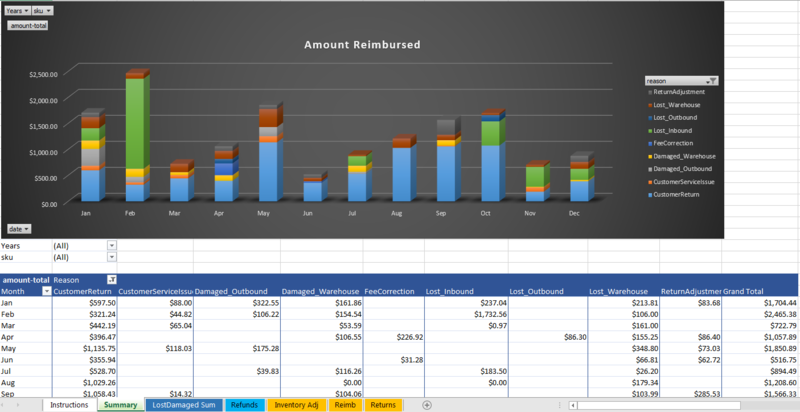 This is to indicate who refunded a customer, since there is no way to tell in the data reports. – Added AUTO-IMPORT for all data. You can now click a button to generate and download all reports the spreadsheet needs. 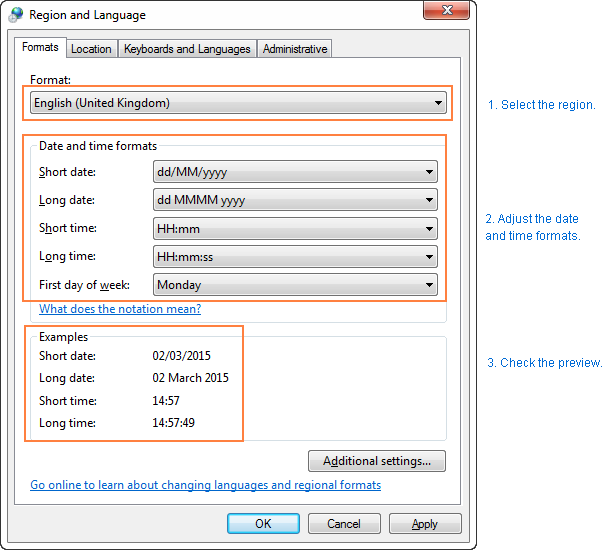 – Added Auto-Import support for French, Spanish, German, and Italian versions of Windows. – Added option to Auto-Import sales data when clicking on Auto-Import All Data. 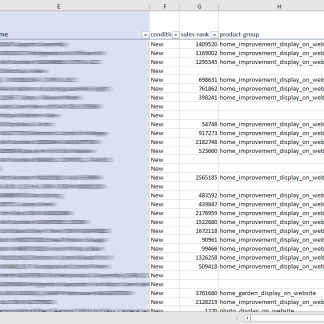 Sales data can now be imported separately. – Added new "Problem?" to Refunds – "yes – incorrect amount returned & not reimb " – Order was refunded, and customer returned items from the order, but it was the incorrect amount, and Amazon did not reimburse you for the missing items. 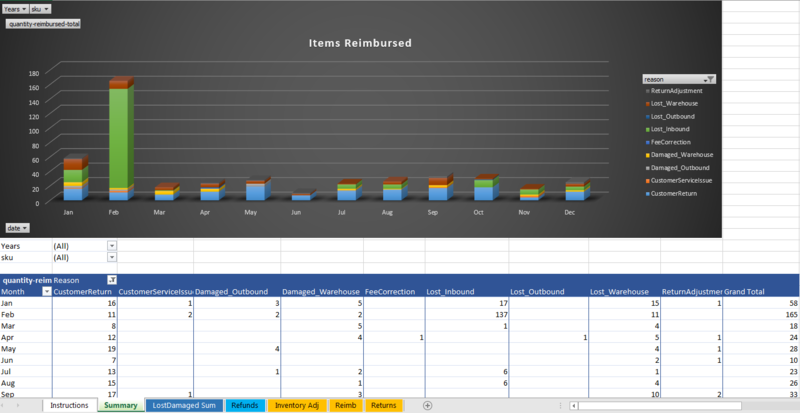 – Added Reimbursement amount and qty on Refunds sheet when the reason is classified as "CustomerServiceIssue"
– Fixed bug that prevented more than 7 SKUs from loading on the LostDamaged Sum sheet. 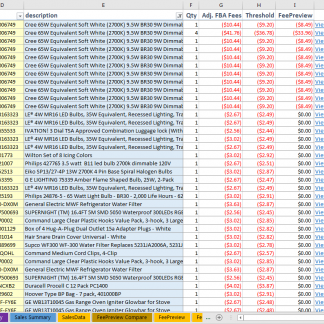 – Added option to count UNSELLABLE inventory in lost and damaged totals. 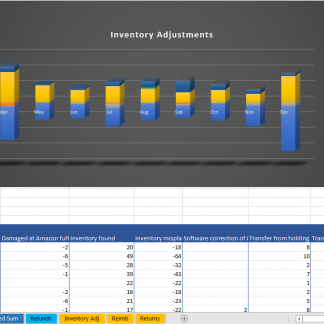 – Changed how "From Holding" works slightly – This is now The difference between SELLABLE inventory transferred to and from a holding account. Amazon will put sellable inventory into a holding account when they previously reimbursed you for inventory and then found it. If this is a negative number then that is currently how much is IN your holding account. A positive number is how much went towards reimbursing you for lost or damaged inventory. – Fixed issue with reimbursement reversals (lost, damaged, and refunds) when cash reimbursement is reversed, but then is replaced with inventory. – Changed time to from refund to reimbursement for non-returned inventory from 30 to 45 days. This will lower false positives a bit. – Fixed bug preventing data from updating correctly for the first time. – Added some error checking around the reports that are downloaded to make sure they are the correct ones and retrying if necessary instead of skipping the file. 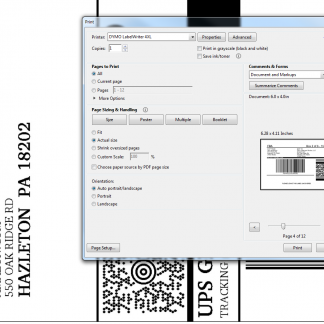 – Added system to auto-import shipment data to help you reconcile FBA shipments. This only works with Excel for PC. – Reduced the amount of false positives in Refunds sheet for "check reimb amount". This was previously flagging orders where shipping was refunded to the buyer, then to you. – Changed \\\\'refunded after 35 days\\\\' to 60 day to reduce false positives in the Refunds report. I operate in 5 countries: UK, Spain, Italy, Germany, and France. 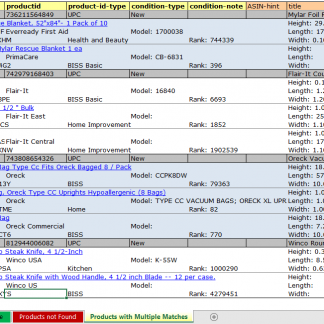 Lost/damaged inventory is very difficult to reconcile on Amazon Seller Central if you have large inventory and sales. 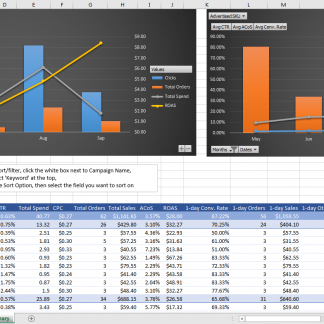 I use this Excel tool every 2 o 3 months and I usually recover more than 2.500€ (+2200USD) every time I use it. Support from the developer is awesome. It was not working properly for Europe on earlier versions due to the complexity of the Amazon reports and the bugs were solved properly in a timely manner by him. It works very good now. 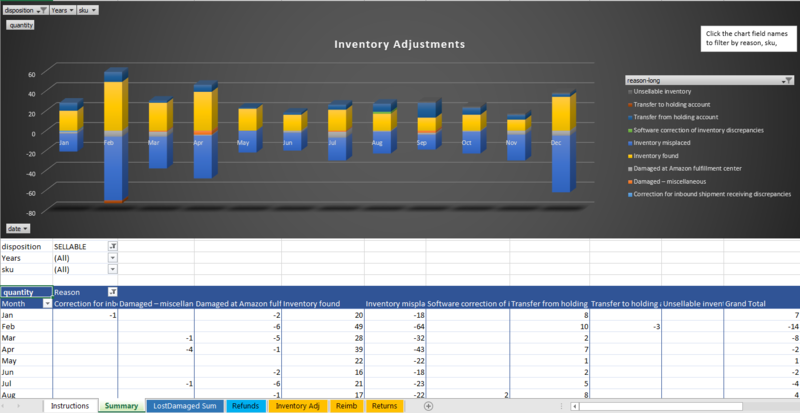 I’m very happy with the results and it is an Excel file every seller should have to reconcile inventory. You will find out how many times Amazon fails on giving back money that belongs to you. I’m very happy with it. I would take days every month to reconcile manually. How do I tell Amazon to give me a refund on the items lost or damaged? If the number in Total Discrepancy is greater than 0 for an individual SKU, open a case with Seller Support under Selling on Amazon > Fulfillment by Amazon > FBA Issue > Something else. You’ll want to provide as much information as possible to make the process easier for them. 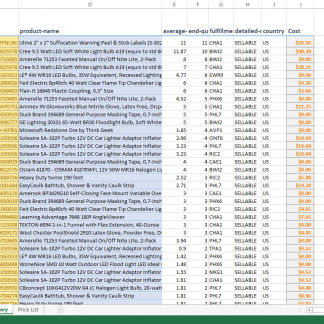 If you have a lot of different SKUs that were lost/damaged you should do them in batches of no more than 10 SKUs or so. We don’t want to overwhelm Amazon support. That and this will make it easier to track in the future. Since it has been more than 45 days since these items were lost or damaged, I would appreciate a reimbursement per Amazon’s FBA Lost and Damaged Inventory Reimbursement Policy. Please let me know if there is any other information I can provide! 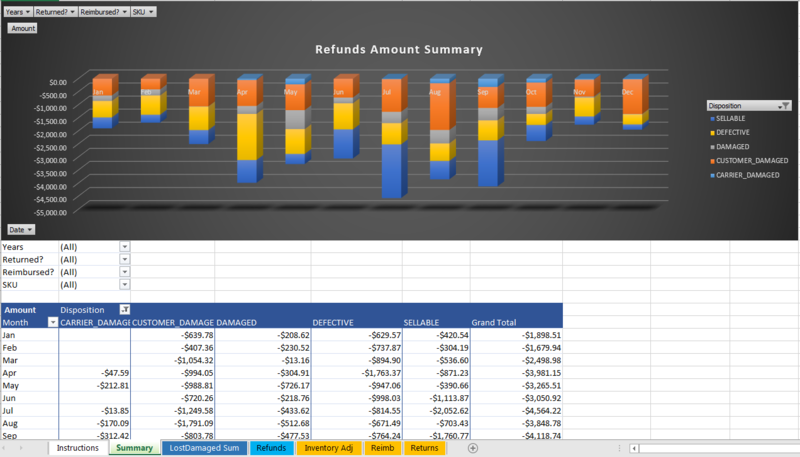 Can I use the Refund & Lost Inventory Reimbursement Checker with Google Sheets? v1.0 will work with Google Sheets, but v2.0 will not. 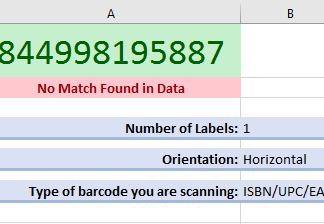 However, for v1.0 to work with Google Sheets, you must copy/paste in the reports manually as the macros that support importing data will not work. 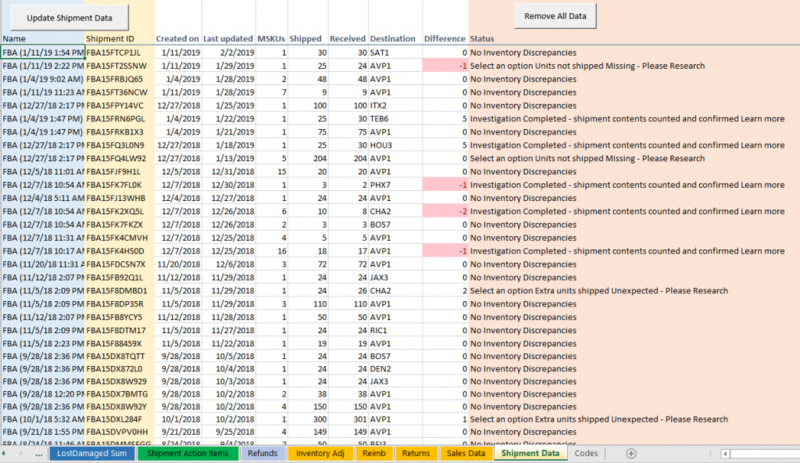 Why are there are a lot of discrepancies in the Lost-Destroyed report? 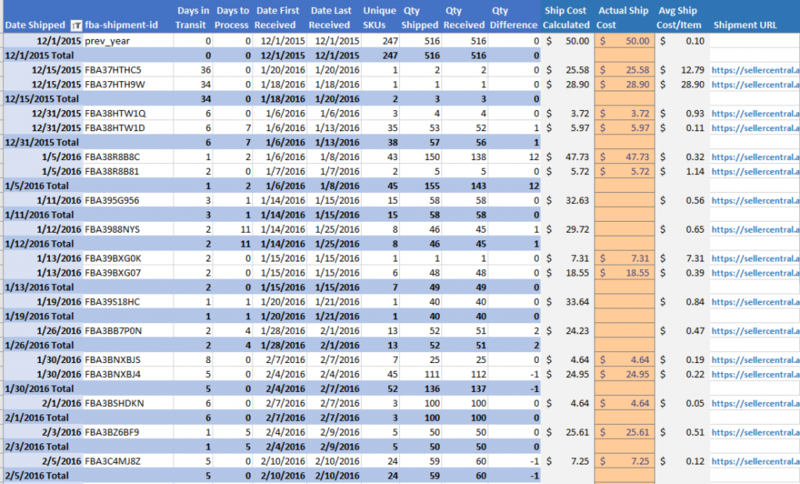 Either Amazon has lost a lot of your inventory, or there is an overlap in the data. If there are a lot of discrepancies in the beginning of the report, the former is more likely. To fix this, and make the report more accurate you should filter out lost inventory that has been lost in the past 45 days. 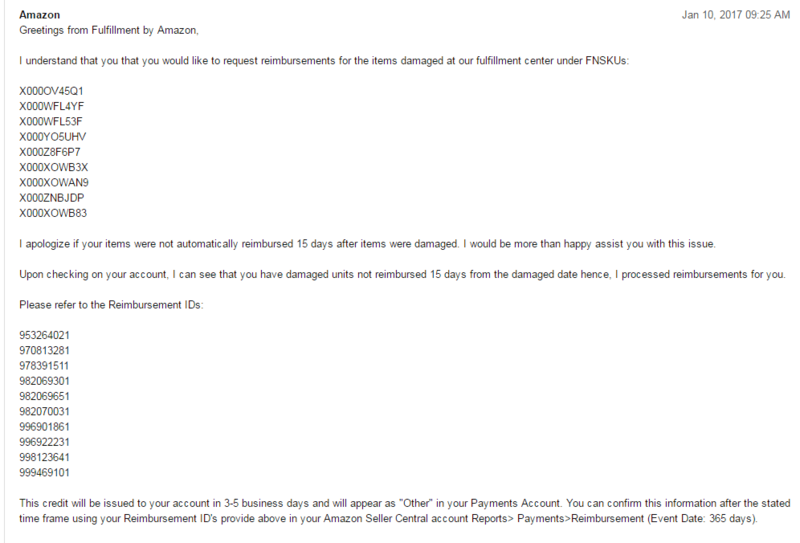 Amazon doesn’t reimburse for lost/damaged inventory for at least 45 days from the time it was reported lost/damaged. Click select all, so everything is un-selected, then click ‘M’. Now only records with M as the reason show show up. Why is the “total discrepancy” 0 or negative? Total Discrepancy is the total difference between all lost & damaged, found, from holding, and reimbursed. 0 means you have already been reimbursed. Amazon counted one or more “From holding” transfers as a Reimbursement – In other words, they sometimes say “Transfer from holding account” on the Inventory Adj report and there is a “quantity-reimbursed-inventory” on the Reimbursements report, but not always. It seems to depend on the situation. Enable them! The spreadsheet needs them to function correctly! 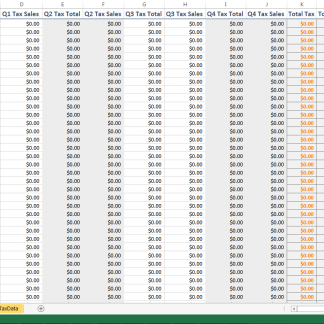 Will your spreadsheets work with Mac Numbers? More than likely, no. 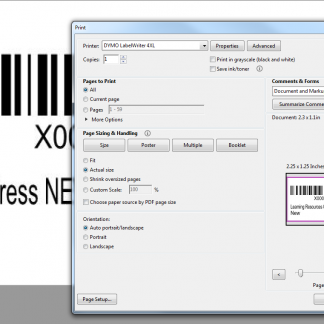 The formulas and macros that we use will not work properly with Mac Numbers. We would recommend using Excel for Mac instead. Within a period of 30 days from the purchase date, if for any reason you are unhappy with our products, you can request a full refund.